What do you think about apple pie for breakfast? That was the plan this morning. It was freezing outside, 49 degrees Fahrenheit (proper cold for us delicate Southern Californians) and I had finally survived two weeks of sheer misery with a monumental head cold. My senses of smell and taste came back. 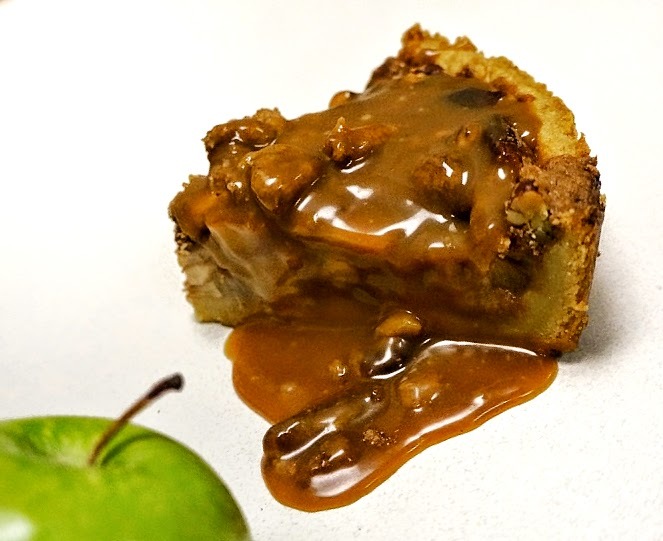 To celebrate, I baked an old favorite, APPLE PIE wrapped in a CRISP CRUST, crowned with PECAN STREUSEL, finished with a hefty drizzle of CARAMEL SAUCE, all from scratch with loads of butter. Then, I cut a slice and set it onto the passenger seat next to me on my drive to work. Before long, my car was brimming with the (very distracting) aroma of cinnamon and caramel. I could not get to my desk fast enough for that first bite with coffee. That was hours ago and that sweet smell lingers (probably just my imagination). The temptation to lick the empty plate next to my keyboard is overwhelming, contained only by the fact that I am at the office. What if someone saw? 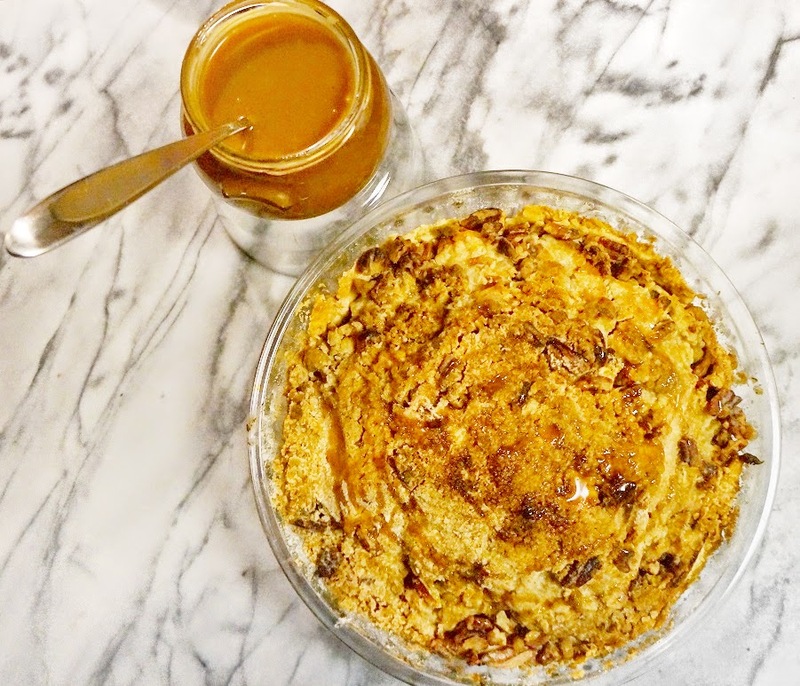 Not only does this pie taste amazing, it is also fun to make, especially with the kids. 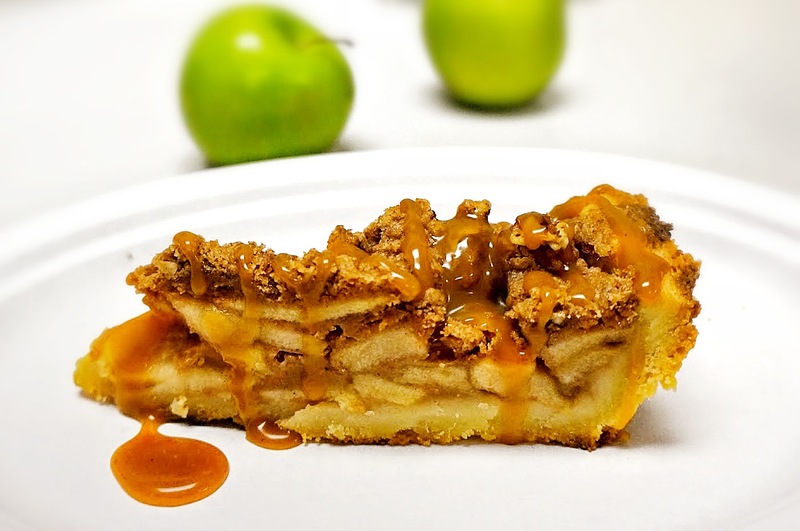 There are 4 parts to it: The luscious caramel sauce, toasty streusel, the fruity filling and crumbly crust. All but the filling can be made ahead of time, ready when the craving strikes. The caramel sauce and streusel topping can be stored in glass jars in the fridge for up to 1 month. The crust is worth making from scratch and freezes well. It is tender and crumbly with just the right amount of buttery sweetness. There is no waiting for the dough to rest in the fridge. Just throw it together and bake it. A few tricks guarantee success. The butter must be very, very cold. 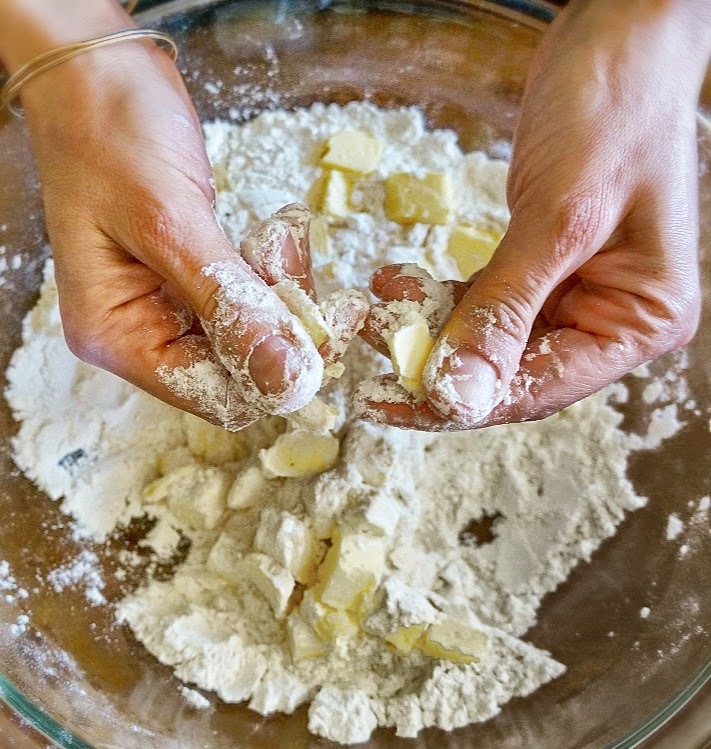 Pressing the butter into the dry ingredients between your fingers forms sheets of dough. Finally, a splash of icy vodka is the secret to the flaky texture, but the taste is transparent. To prevent the fruit juices from making the bottom of the crust soggy, simply brush egg white over the inside of the crust and bake it shortly for the coating to set. This creates a barrier between the crisp crust and fruit juices. 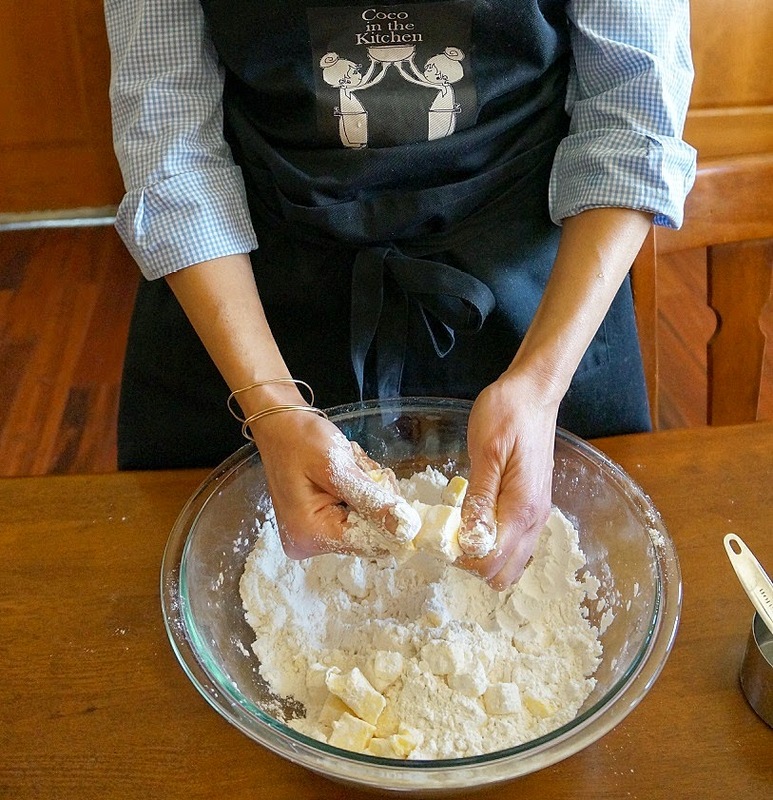 Wearing a pretty apron not only keeps your clothes clean, but also gives you the confidence to bake like a champ! Like my apron? Enter below to win your own. It’s my Christmas gift to you! This pie is something special. There’s magic in it. With little effort, somehow it all comes together in this gorgeous, fragrant, delicious old timey package of goodness, the sort of thing your great grandmother made with nothing but a big bowl and wooden spoon. Cut butter into small cubes and put it into the freezer for 5-10 minutes. sift exactly 3 times into a big bowl. This makes for a very flaky crust. Wash your hands or put on cook’s disposable gloves. Sprinkle butter cubes over the dry ingredients. Working quickly, flatten the butter into the flour mixture between your fingers.Add iced water and cold vodka. Knead by hand until the dough comes together. (If you don’t plan on baking the pie right away, wrap the dough in plastic and pop it into the freezer where it can stay up to 1 month. )Dust a clean surface with flour and roll the dough to about 1/8-inch thickness. Roll dough around the rolling pin, lift it and unroll over the pie dish. Gently tuck the dough flush against the baking dish. Allow the crust should hang over the edge of the pie plate as it will shrink a bit in the oven. Combine flour, brown sugar and salt in a bowl. Cut butter into the dry ingredients. Gently toss chopped pecans into the mix. Wash, peel and core the apples. Cut into about 1/4-inch thick slices and collect them in a bowl. Dust with cinnamon, allspice, brown sugar, starch and salt. Toss gently with your hands to coat the apples and let them rest for about 10 minutes. Brush the inside of the crust with the egg white and up the sides. Transfer to the hot oven and bake 10 minutes. Meanwhile, strain the juices from the apple mixture. Remove crust from the oven and pile apples over the crust. Cover evenly with the streusel and return the pie to the oven. Bake for 1 hour.Remove from the oven and allow the pie to rest 10-15 minutes. Drizzle with caramel sauce and serve with ice cream. Making something by hand is so rewarding, especially if it is something delicious that you can share with others. The holidays are here and it’s time for no-holds-barred over-the-top extravagance. I’m not talking about truffles and caviar, folks. If you can’t pronounce it, you won’t see it here. Memories of Grandma busy making old timey goodness in the kitchen fill my head. Let the fancy mixer collect some dust. 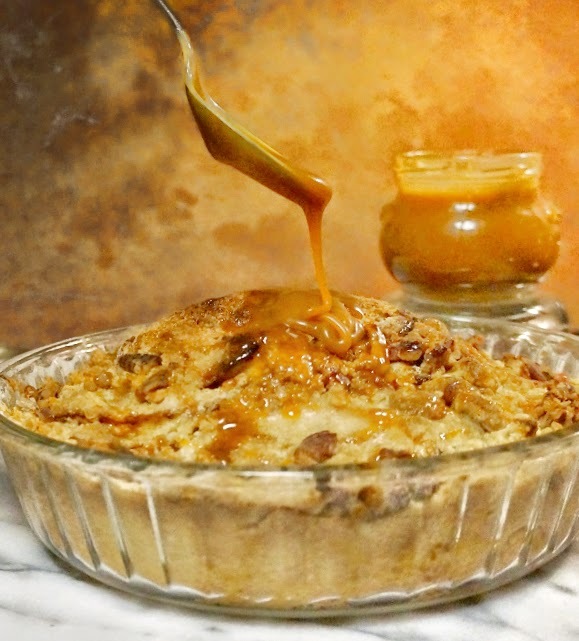 Grab a big bowl, wooden spoon and come, bake a caramel apple pie with me. Every bit of this dessert is rich with flavor, because every bit of it is homemade from scratch. There really is no better way to celebrate the season and no better gift than something homemade with care. Congrats to the Kitchen Lioness and Cocoa & Lavender for winning our giveaway. Thanks to everyone for participating. Stay tuned for my next giveaway, y’all! 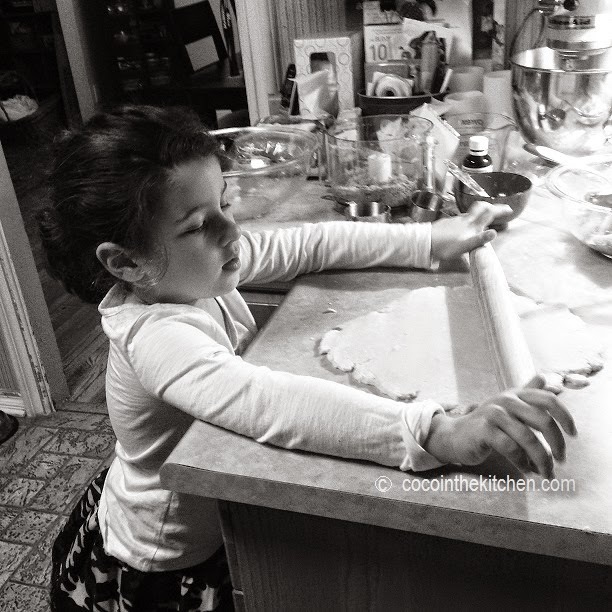 Oh, Colette – I would so love to be in the kitchen together with you! What would I make while wearing your apron? Something sugary, floury, and messy! Maybe your apple pie! Colette, looks like a wonderful comfort-style pie to bake for the family. Love the smell of cinnamon and apples and love your pretty apron! I would wear it when baking all those Christmas treats around this house! What a fun giveaway! Ok, I'll be right over for all my desserts! Do you have a cup of tea to compliment everything?